Photographic Story This image was taken in 2012. 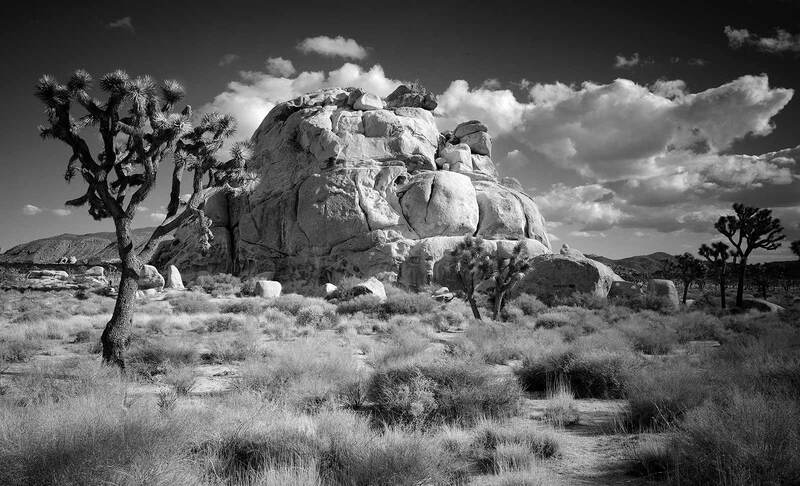 We were on our way to the coast of California and hadn’t been to Joshua Tree since sometime in the 70’s. So we decided to check it out again. We spent a couple of days having fun photographing out there, but it wasn’t long enough. Digital – Archival Pigment Print This photograph was taken with an analog large format camera. After Clyde develops the negative, the film is scanned and edited in a computer program mimicking his darkroom techniques. The photograph is printed on an Epson Stylus 4800 or 11880 printer. Clyde uses archival Ultra-chrome K3 ink and prints on archival Harman Hahnemuhle paper. The limited edition photograph is then mounted and matted to current archival standards. This is a limited edition series and each photograph is numbered.